Orange-tinted snow has been reported across Russia, Bulgaria, Romania and other countries in eastern Europe. The strange-looking snow has been reported in ski resorts in Krasnaya Polyana, near the western Russian city of Sochi. 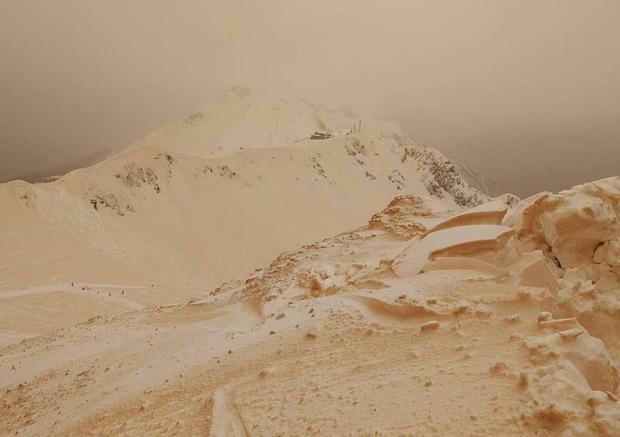 The orange snow is believed to be the result of sand and dust stirred up and carried into the atmosphere from storms in North Africa, before being deposited in the region. Steven Keates, of the UK's Met Office, said the phenomenon was "feasible” and had previously been seen elsewhere around the world. “There has been a lot of lifted sand or dust originating from North Africa and the Sahara, from sand storms which have formed in the desert,” he said. “As the sand gets lifted to the upper levels of the atmosphere, it gets distributed elsewhere. “Looking at satellite imagery from Nasa, it shows a lot of sand and dust in the atmosphere drifting across the Mediterranean. Where the particles of sand or dust are deposited depends on the direction of the wind. Last year, the sun and sky over the UK turned a red colour as a result of Hurricane Ophelia dragging tropical air and dust from the Sahara. In 2007, residents of Siberian towns reported foul-smelling orange snow that was oily to the touch. Officials said the snow was caused by a storm in neighbouring Kazakhstan which had swept up dust and clay and deposited it on the Omsk region. According to Russia’s environmental watchdog, however, the snow was possibly the result of chemical pollution as it contained large amounts of iron, acids and nitrates.